Let’s face it, we all look for a shortcut in cooking sometimes, but for one that doesn’t sacrifice taste of the dishes we make. Yesterday, after I finished my Zumba workout I was tired and didn’t want to mess with individually stuffing pasta shells, but I have been craving pasta for a while now. We try to eat as much whole wheat organic pasta as we can and those big stuffing shells that you see at the grocery store are not exactly what I am looking for. So over the weekend, I bought some organic whole wheat shells – regular size, and decided to toss them with ricotta, spinach, and pancetta (Italian cured bacon) instead of stuffing them. It’s quicker and uses the same ingredients, thus you get the same flavor. This dish was a hit. 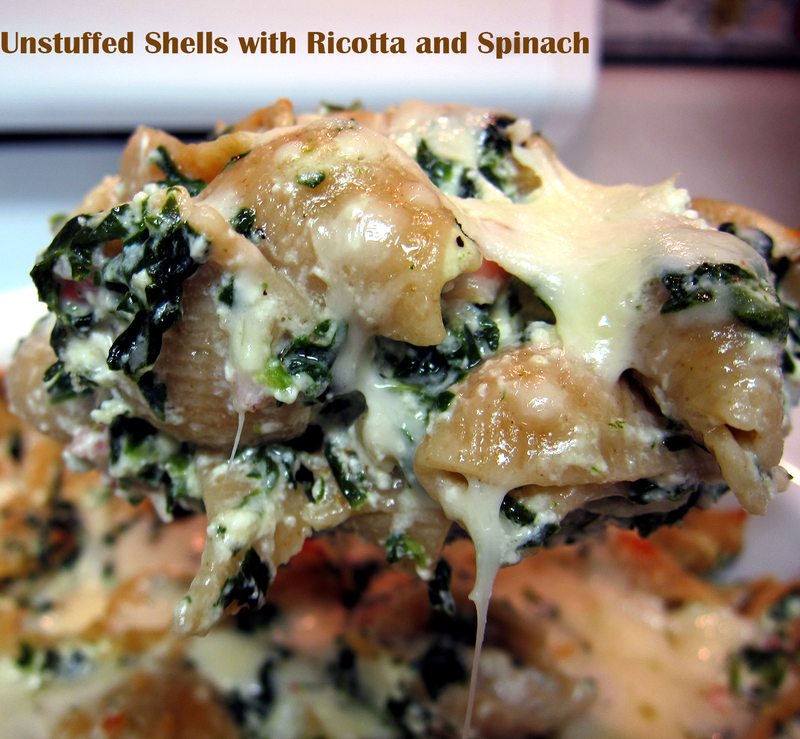 If you have a big family or trying to get your kids to eat more nutritious foods, this recipe is for you! The whole wheat pasta is full of fiber and lower in carbs compared to white pasta. Plus there is lots of spinach, which is full of fiber and antioxidants. The recipe is big enough to feed an army. You can even bring this for a potluck. If you have a small family, you will surely have yummy leftovers the next day. Speaking of which, I am off to heat some up for my lunch. Bon Appetit! Bring a large pot of salted water to a boil over high heat. Add the pasta and cook until tender. Drain pasta. Add the olive oil to a large skillet over medium heat. Add the pancetta and cook until lightly golden, about 5 minutes. 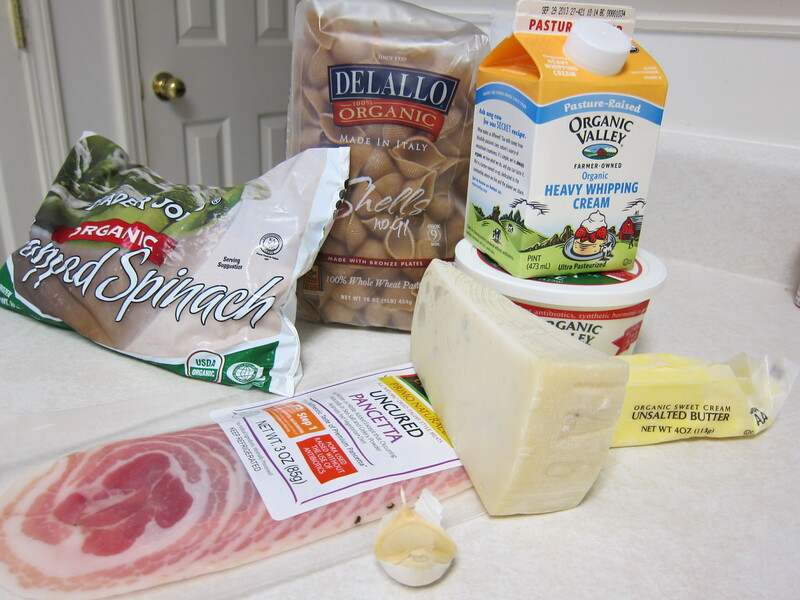 Remove the pancetta from the pan and transfer to a large bowl and add the spinach, ricotta cheese, asiago cheese, pepper, and nutmeg. Stir to combine. Set aside. Melt the butter in a medium saucepan. Add the garlic and cook for 1 minute. Add the cream and bring to a simmer. Turn the heat to very low and add the 2 cups asiago cheese and pepper. Stir until the cheese is dissolved. 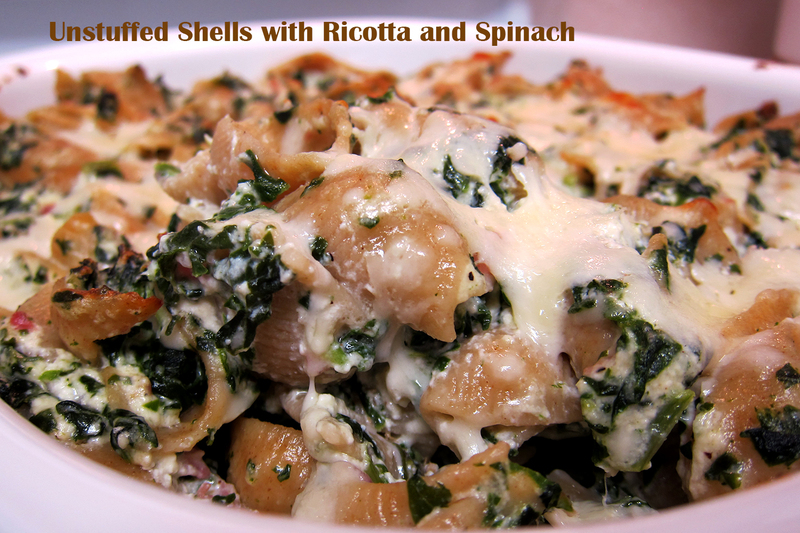 Pour the sauce over the shells, mix well. Taste to see if salt is needed. Top with the remaining 1/4 cup asiago cheese. Bake until golden on top, about 20-25 minutes. Remove from the oven and serve immediately.